David Bouley is a Connecticut native who studied at the Sorbonne and has won awards for his French cuisine. 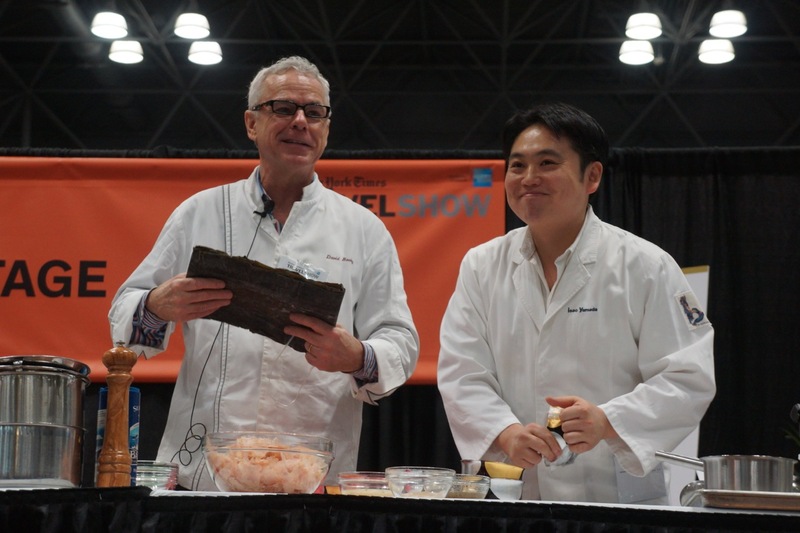 But Chef Bouley was at The New York Times Travel Show on Saturday to share his connection to Japan. Chef Bouley’s cooking demonstration on the Asia Stage emphasized how French food is incorporating Japanese kaiseki cooking. Joining him on stage was Chef Isao Yamada of Brushstroke, the Michelin starred restaurant that’s a joint venture between Chef Bouley and the Tsuji Culinary Institute in Osaka. Chef Bouley began his demo by preparing dashi, or stock, using kombu, a nutrient-rich sea vegetable; dried bonito flakes; and kuzu (or kudzu, as it’s called in the American South), a gluten-free thickening agent that replaces the need for hard-to-digest ingredients such as butter, flour, and cornstarch. The result was a beautiful black truffle dashi with porcini mushroom puree, crabmeat, and chawan mushi (Japanese custard) that was as delicious as it was healthy. Chef Bouley liberally uses seaweed and other Japanese ingredients such as koji (a bacteria essential to miso and sake), yuba skin (a tofu film he ships in from Kyoto), and kuzu in the kitchens of his restaurants. Brushstroke runs on the principle of a kaiseki tasting menu that leaves you feeling energized rather than full to bursting or ready to slip into a food coma. That’s because, Chef Bouley says, these ingredients, in addition to their depth of flavor, have digestive properties that allow our bodies to burn energy while we’re eating. “This kind of food is totally in sync with the digestion of the body,” Chef Bouley told JapanCulture•NYC. Chef Bouley’s exploration of Japanese food has given him appreciation not only for the cuisine but for the people who make it. “Japanese chefs are 99% production and 1% ego,” he says. “The Japanese chef wants to know how far he has come in serving Mother Nature,” referring to the use of premium ingredients and not letting any part of the animal or vegetable go to waste. To share examples of this concept and to introduce Westerners to the Japanese kitchen, Chef Bouley is embarking on a Culinary Journey to Japan, organized by Food and Wine Magazine. For ten days in March, Chef Bouley will accompany twenty guests to Tokyo, Kyoto, and Nagao, offering them an exclusive look at one of the world’s most fascinating cuisines. The itinerary includes a visit to Tsukiji, Japan’s iconic fish market; tours of a wasabi farm, a mushroom factory, and a sake brewery; and a lavish dinner in Gion, the geisha district in Kyoto. Guests will shop at local markets, enjoy kaiseki dinners and other feasts, and learn how to prepare traditional Japanese dishes at cooking classes taught by Chef Bouley and Japanese chefs. Through this tour, Chef Bouley hopes to show “how your life at home can integrate some of these (Japanese) elements into your kitchen pretty easily,” he says. If you missed Chef Bouley’s demo at The New York Times Travel Show and you’re unable to join him in Japan, you can still experience his respect for Japanese cuisine at his restaurants, Bouley (163 Duane Street) and Brushstroke (30 Hudson Street).